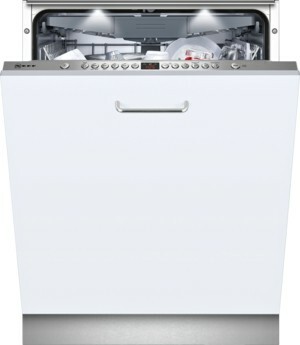 The S513M60X1G Full Size Dishwasher has 6 programmes and 13 place settings for your convenience. By using VarioSpeed, your dishes are cleaned up to 50% quicker, without compromising on the quality of the clean. The load weight is detected by the machine and alters the water required for your wash cycle. So if you need to get a larger amount of dishes cleaned, more water will be added into the cycle for soaking purposes; and if you only have a small load to clean, less water is added; saving energy and you money off your utility bills. The VarioFlex baskets offer more capacity and more flexibility when loading your dishes. There are two foldable racks in the upper basket and a further two in the bottom basket. Pots and pans of all sizes, wine glasses, cups, and plates are no hassle to this dishwasher. You can adjust the baskets to adapt to any load you need to put on. Cleaning convenience at its finest. Rackmatic allows you to extend, raise or lower the top basket in stages, even when fully loaded offering you total flexibility and convenience. This Neff dishwasher is exceptionally quiet, even when running a full load. Using a brushless EcoSilence Drive motor, general wear and tear of the appliance is reduced, giving you a dishwasher with very low noise levels. This is particularly handy if you want to run your dishwasher at night, when energy costs are at their cheapest. You can rest assured no one will be disturbed from their night's sleep. Dosage Assist is a handy feature which ensures that your dishwasher tablet and detergent gets completely dissolved evenly before being released out into the cavity of the dishwasher, ensuring dazzling results are achieved every time. For added peace of mind, Aqua Stop protects against the risk of flooding in an unlikely event of a water overflow. Water flow is stopped directly at the source at the tap by a mechanical valve, halting any further flow and reducing the risk of flooding - giving you extra peace of mind that your kitchen is safe from any waterworks.